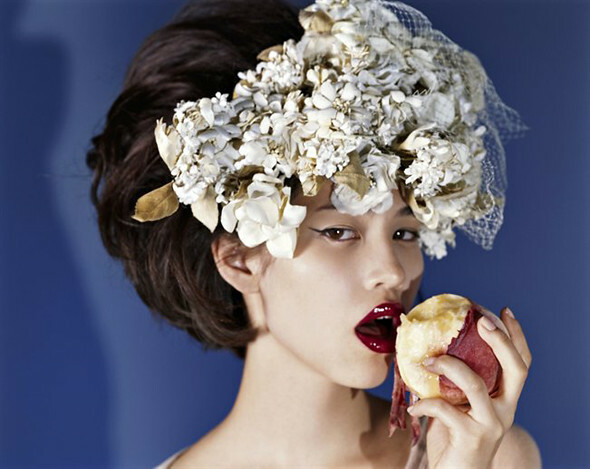 Japanese model, Kiko Mizuhara (水原希子) was once again photography by Nobuyoshi Araki. This time, not for Vogue but Barneys New York. The background looks a little like Vogue Nippon's shoot, no? But I love this so much more, especially the shot where she presses the two squid on her assets. How was the experience of working with Araki on the Barneys shoot? As is always the case in any Araki photo shoot, I came out with movements and expressions that I can’t even believe I’m capable of. It surprises me every time—it’s so exciting. You had to use some pretty interesting props―raw squid for example. Read the entire interview - "All Eyes On Kiko" on Nowness.com. All photographs by Nobuyoshi Araki on Nowness.com. very interesting concept, love the sense of surrealism n those diy accessories - will take for my inspiration blog post!